Photo 1 taken by B on a trail in the Banyowla area near Kelmscott with views to the Champion Lakes below. *Summiting Mt Trio in Stirling Ranges since 1983. 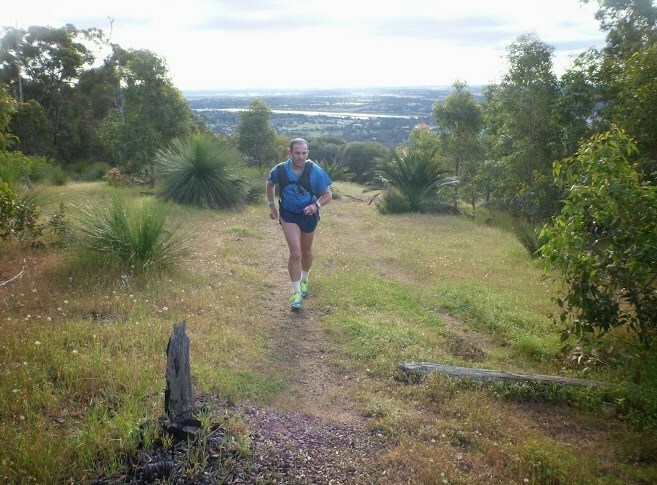 *Exploring trails near Wungong Dam since 1984. *About 15 summits of Bluff Knoll since 1986. * Bibbulmun Track multi-day hiker since 1987. *Double Bluff Knoll ascent in 2017. *Round Bald summit,Tennessee USA on the Appalachian Trail. *North Mirlpunda Track route and completion of half the Stirling Ridgewalk including Ellen Peak. *Mt Cooke ascent on the Bibbulmun including signing the cave visitors book near the summit. 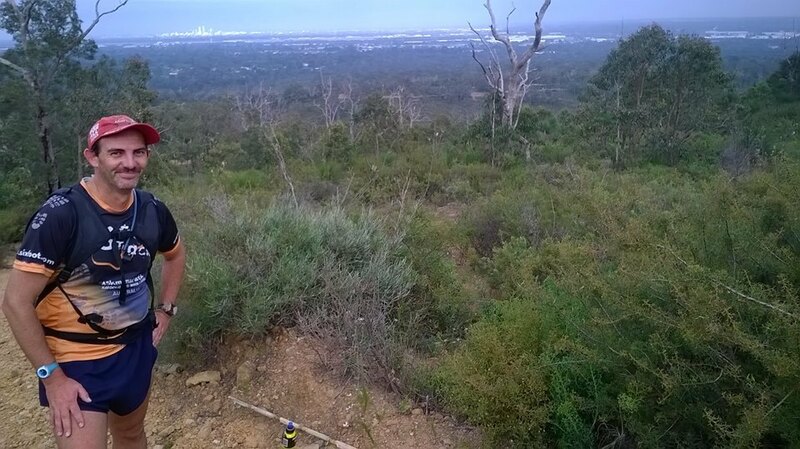 *Yaberoo Budjara Trail 28km from Currambine to Yanchep completion in 2014. *Kattamorda Trail 30km Up run and Down run completion in 2017. *Perth City to Surf Marathon finisher in 4.00 in 2015. *31-time road marathon finisher with a 3.49 PB as of 2016. *Giants Cave and Ngilgi Cave. *Abseiling at Stathams Quarry and forward run down abseils on seacliffs. *Whitewater rafting near Bells Rapids. *Team Gold medal in Australian Junior All Schools 8km walk 1989. *State Champion 1990 U/20 20km walk. *Australian University Games 5km walk 6th place. *Australian Championships 1998 50km walk 6th place. *20-time finisher of Bridges funrun in Perth. *Recon run leader for 6 inch in various years. *Former Basketball coach and referee. *Advising many runners in their marathoning or ultra goals for more than a decade. *B Soc. Sc. (Leisure Science) degree from ECU with an extra major in Sports Science. Primary Education studies with a major in Physical Education. Jon is a Fremantle Dockers, Perth Wildcats and San Antonio Spurs fan, has some significant music interests, authored his own website from 1996-2015, and admins on various fb groups. St Georges Cathedral chorister in 1989, won a premiership playing junior AFL for Armadale in 1986, has tried his hand at Go-Karts, novice triathlons, basketball, volleyball, and chess. Jon lived in Mullewa and Geraldton for 1 year each in the early 1980's, and has 5 brothers and sisters. Born in Perth, and grew up mostly Armadale. Jon is a worshiper of the Creator Triune. Our expert knowledge can guide you to the trail treasures! Discover the Darling Scarp TRAILS! Thunderstruck Toptrails Perth has the treasure map to the best trails. RESET, ETOW or even APACHE. *Lark Hill and WTF ultras racer. *11 time finisher of 6inch trails 47km since 2005. *Exploring trails near Wungong Dam since at least 1984. *More than a dozen summits of Bluff Knoll in the Stirling Ranges since 1986. *Four summits of Mt Toolbrunup arguably the toughest mountain in the Stirling Ranges. *Round Bald summit in Tennessee USA near the Appalachian Trail. Also studied Primary Education with a major in Physical Education. Jon is a Fremantle Dockers, Perth Wildcats and San Antonio Spurs fan, has some significant extreme music interests, authored his own website from 1996-2015, and admins on various fb groups. He was a St Georges Cathedral chorister in 1989, won a premiership playing junior AFL for Armadale in 1986, has tried his hand at Go-Karts, novice triathlons, basketball, volleyball, and chess. Jon lived in Mullewa and Geraldton for 1 year each in the early 198o's, and has 5 brothers and sisters He was born and bred in Perth, mostly Armadale. -Want to get paid to lead a group?